150 minutes of moderate exercise a week (5×30) or 75 minutes of vigorous exercise a week (3×25) AND 2 x strength training sessions a week. However, are these guidelines really the perfect amount, and is there such a thing as too much exercise? It’s only natural to think that more is better, but we also know recovery/rest is important. What about the law of diminishing returns: does this apply to health and fitness? Law of diminishing returns – when we are new to training, our fitness and strength levels improve rapidly. However, as we become fitter our rate of improvement may plateau, as we approach our limits. We therefore need more stimulus to keep the improvements going – the stimulants being training volume, intensity, frequency which can be manipulated, but then there is a point where the amount of energy invested into training is more than the improvements gained – meaning we are wasting energy and time and this can be frustrating. Research shows training 3 days a week to be better than training once a week when the total volume is the same. In a study, subjects were split into two groups: one group performed 3 sets to failure once a week and the other group performed 1 set to failure on the same exercises 3 times a week. The results showed that frequency is a key role in strength development. There are other studies which showed 3 days a week full body training had better results than 3 days a week split routine. The total body session focused on one exercise per muscle group and the split group targeted only 2 to 3 muscle groups per session. The sessions used in this study can be seen below. Cardiovascular training does not just mean running, cycling or swimming: other forms of cardio do exist! When thinking of cardio, think of increasing your heart rate. Our heart responds to exercise by increasing its beats per minute in order to supply enough oxygen to the working muscles. The harder we work (intensity), the more oxygen the muscles need, the higher your heart rate goes in order to meet the demands of oxygen. This means increasing the heart rate – between 55% and 70% heart rate max for moderate activity and 71% and 90% heart rate max for vigorous activity. How many beats per minute would this be? 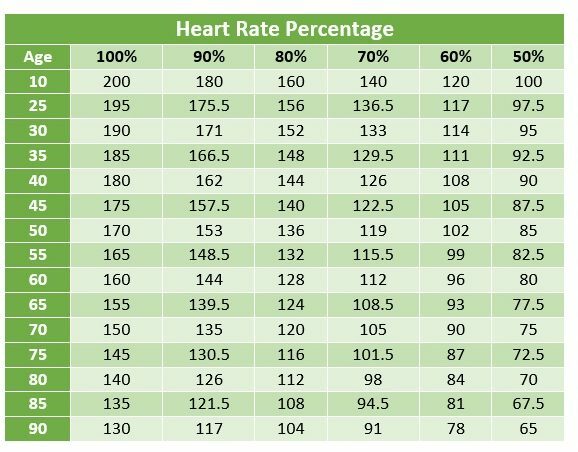 This depends on your age, as we age our maximum heart rate decreases, meaning what once represented working at 50% now could mean working at 70% of your heart rate max. What do you need to do to get your heart rate up? It’s really up to you! It could be a jog, a walk-up hill, cycling, swimming, a team sport or even resistance training circuit style. All these activities will increase the heart rate. All these activities will allow you to meet the government guidelines. How you split your training week up each week will depend on your training goals – 2 days of strength training and 3 days of cardiovascular work, or 3 days of strength training and 2 days of cardiovascular work. Monitor your progress, if you are not progressing what you are following may not be working.